Marilyn Minter: I’m Not Much But I’m All I Think About, installation view, Contemporary Art Museum St. Louis, September 11–December 27, 2015. Photo: David Johnson. Marilyn Minter, I’m Not Much But I’m All I Think About, 2011. HD video, 3 minutes. Courtesy the artist and Salon 94, New York. 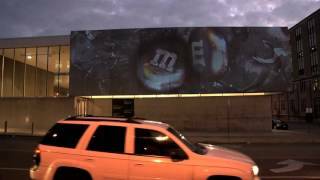 CAM presents I’m Not Much But I’m All I Think About (2011), a single channel projection by New York-based artist Marilyn Minter, as the latest installment of its Street Views series of exterior video works. Projected on the Museum’s facade, the video is on view from dusk to midnight every night from October 2, 2015, through January 10, 2016. Minter is known for work that engages with provocative images of female sexuality. She emphasizes beauty, glamour, and fashion, conflating them with an idealized womanhood. In her work, femininity is humorously fetishized, something to be adorned and subsequently consumed. The title—I’m Not Much But I’m All I Think About—is simultaneously humorous and self-consciously narcissistic. This work, like much of her oeuvre, plays with ideas of artists’ identity, anxiety, and bravura all at once. The film begins with an overhead view of a bubbling, oozing gray liquid; its mesmerizing undulations referencing the motion of a hot spring or a pool of molten lava. An M and an E slowly descend from above and rupture the metallic liquid surface. Upon impact, the liquid ebbs and subsequently surges in, entirely submerging the letters. This process continues cyclically with subtle variations: the letters alternately appear in silver, gold, and absurdly enough, in the form of M&M candies, with each subsequent iteration larger and more dramatic than the last. The viewer soon realizes that the letters share an identical shape at different rotations. They appear to spell the word “ME” but also represent MM—the artist’s initials—imbuing the film with an autobiographical quality. Marilyn Minter (b. 1948 Shreveport, Louisiana) is a multidisciplinary artist living and working in New York. The major retrospective Marilyn Minter: Pretty/Dirty opened at Contemporary Art Museum Houston in 2015 and will travel to the Museum of Contemporary Art Denver, the Orange County Museum of Art, and the Brooklyn Museum. Minter has been the subject of numerous solo exhibitions, including the Deichtorhallen in Hamburg, Germany (2011), the Museum of Modern Art, New York (2010), the Museum of Contemporary Art, Clevland (2010), the Center for Contemporary Art, Cincinnati, OH (2009), La Conservera, Centro de Arte Contemporáneo, Ceutí/Murcia, Spain (2009), and the San Francisco Museum of Modern Art (2005). Marilyn Minter: I’m Not Much But I’m All That I Think About is organized for the Contemporary Art Museum St. Louis by Jeffrey Uslip, Chief Curator. Special thanks to Salon 94, New York.